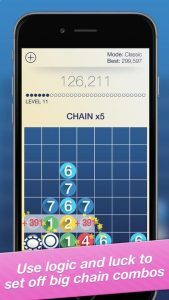 Drop 7 is deceptively simple, hypnotically fun, and offers endless opportunities for mastery and mental challenge. Drop discs onto a grid, clearing discs when the number of discs matches the amount of discs in a column or row. Try to get chain combos and score as many points before the board is filled. One of Esquire Magazine’s Best Downloadable Games for Any Phone, Console & PDA. Choose amongst the more relaxed Classic mode, the quick-round Blitz mode, and the consistent Sequence mode. See how you rank against your friends and others globally, and prove you are the Drop 7 master! Earn fun achievements by completing challenges for chain reactions, clearing the entire board, and more! Use of this application is governed by the Zynga Terms of Service. These Terms are available through the License Agreement field below, and at m.zynga.com/legal/terms-of-service. This game does permit a user to connect to social networks, such as Game Center, and as such players may come into contact with other people when playing this game.